This week the 100 analog and 100 digital sawbench PCB’s finally arrived. We already had 20 before and these are now fully soldered and tested. The PCB’s seem fine: the silkscreens are now DIY-proof (all values are printed). 100 analog and 100 digital boards.. arrived yesterday. Preview of the frontplate graphics (pots and buttons are not shown here). The graphics will be inverse. The background will be aluminium and the font and drawings in blue. The best news is that the colour will be integrated into the aluminium skin, making it scratch-proof and solvent-proof! Honestly, we cannot wait to get our hands on these casings, but it will have to wait for a bit. Read on.. There have been some questions about the delivery schedule..
First of all, Kickstarter informs us of a 14 day period to collect all the pledges. This would (ideally) mean we’ll have the money by April 16th.. and can then start paying for casing fabrication. The way it looks now the bare bones kits will be able to ship this month (April). We have enough PCB’s and a small batch of potentiometers should arrive in a few days. Casing production (of 200 units) will take 4 weeks in total, and can only start when the Kickstarter money is in: it’s the most expensive part of the product.. We’re trying to get the first 100 casings before the end of the month, but we don’t know yet if this is possible. We’ll update this post when we know more.. Worst case estimate is that we can start assembling the full units from May 14th onwards. April 30th: (POSSIBLY) the first 10 cased units may be shipped out! So much has happened in the recent weeks.. Where to start? First off, we’re making a new synth. A full-blown polyphonic, with loads of special features you’re unlikely to encounter in any other device. This time not only intended as a demonstrator, but as a unit suitable for mass production, and as portable and sturdy as you can imagine. 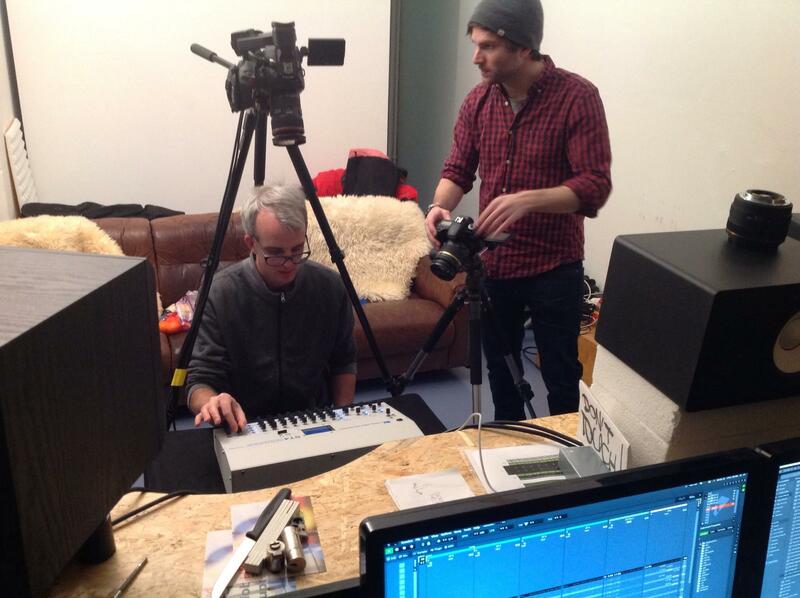 This project is a collaboration between Tasty Chips and STU. We don’t want to reveal too much, but we can say it’s getting there. We’re building all of this around the Arduino Due, much like the TCE-1M. The Due is so powerful that it can do 8 polyphonic voices with multiple oscillators per voice. For this synth, though, we want to keep it limited to 4 and leave some room for other more exotic features. The Due has PWM, which is faster and potentially has more resolution than the Uno. As told in previous posts it’s no problem to crank it up to 300 kHz 8 bit.. or 20 kHz 12 bit. Combining two PWM pins using carefully picked resistors, it’s possible to make 2 x 8 = 16 bit DAC’s, using a simple analog anti-aliasing filter behind it. The Due’s SAM3X micro controller is a true powerhouse. Almost all of its pins are multiplexed, which means they have multiple functions. It turns out you can have way more than the 12 advertised PWM’s. In reality, you can have 4 more.. and now comes the best part.. all of them have complementary pins. That’s normally used for H-bridges and power electronics control where pulses should be complementary but non-overlapping. Complementary PWM signals with “dead time”. This non-overlap is controlled by so-called “dead time”. And this dead time is a user-specified variable per pin. So, just set your PWM complementary pair to 50% and vary the dead time on both. you lose 1 bit of resolution, but you gain 14 additional PWM pins. This means you can have a total of 15 audio DAC’s excluding the two already onboard DAC’s. How’s that for a digital oscillator bank! success, but there might still be problems with making it 16 bit. We’ll just have to see. In any case, the SAM3’s PWM power is the reason we stayed Atmel/Arduino, instead of going for the hugely popular STM32. STM32 is multiplexed in a way that does not allow usage of SPI alongside PWM. Very disappointing for an otherwise great micro controller. 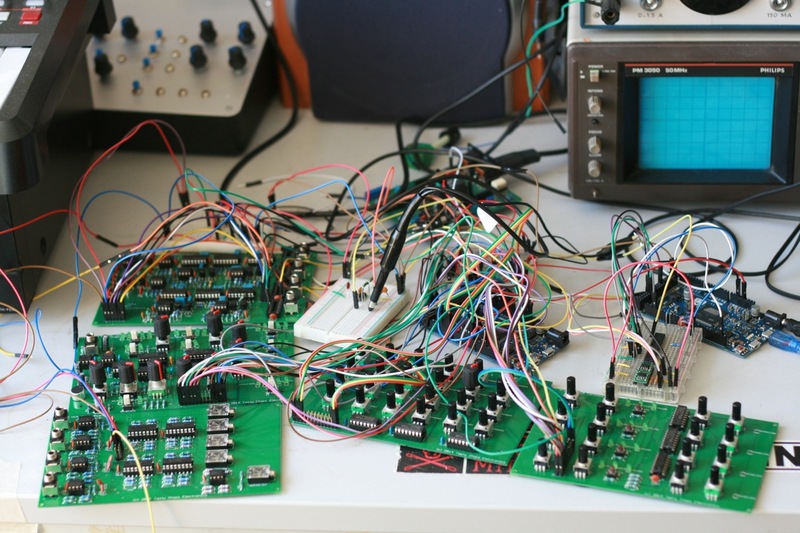 You just need PWM’s if you’re going to do anything with analog synthesizers. There’s just no way around it. A digitalWrite() call is typically 1 microsecond (!) It's direct replacement, however, is only a few cycles!! As you can see these are writes to 2 different registers. One is the Set register, the other the Clear register. This allows the programmer to use only a single write access to the bus instead of the typical read-modify-write. DMA is the other thing that the SAM3X excels. DMA, or Direct Memory Access, was considered a luxury for a long time in the world of the PC, and for an even much longer time in the embedded world. It's an ideal solution to copy data to/from peripherals without using up costly CPU and also avoiding complex interrupt prioritization designs where timer ticks go missing and all manner of nastiness might ensue. Just about anything can be transmitted over the DMAC, and it also has 6 channels. If you want to periodically send out 32 GPIO inputs to a serial bus or dump them to a memory block. It can do that for you. If you want to send out periodic SPI commands and read back their response.. it can also do that. It can do everything. It can even do linked lists.. running a sequence of transfers completely without CPU intervention. The DMAC is just extremely powerful. More akin to what you'd like to find in your mobile hardware, than on a cheap embedded device. The PDC is simpler and is specialized for cyclic transfers. While the DMAC is always disabled after transfers complete, you can just pass the next source and destination to the PDC in an interrupt handler. It will continue to these next addresses without any bump or delay. It is slower, but can still do a few megabyte per second. It can be used to read out the ADC periodically, drive the DACs in the same way and also to read out USB at relatively high speed. Next to the digital oscillator engine, there's the design of all the hardware. 2 out of 4 PCB's have already been laid out and are being feverishly tested and coded on. The focus is on hands-on control. Getting a good, solid and direct user experience as early on in the project. In those terms, some PCB's are easier than others. One contains only a bunch of potentiometers, while others contains a host of buttons, LEDs, rotary encoders, and even a display.. yes..
very close to signal processing theory and has everything voltage controlled: even the resonance. And of course, it is multi-mode (lo, band, hi, possibly even more). The core is realized on breadboard and it sounds fine. It can be really really resonant without going into self-oscillation. But also, it could be able to do self-oscillation for all the analog nuts out there.. if you really push it. But this is something we need to work on, still. All-in-all, we estimate it should still take a month before a workable prototype emerges. We'll keep you updated! Synths in casings + new synth! 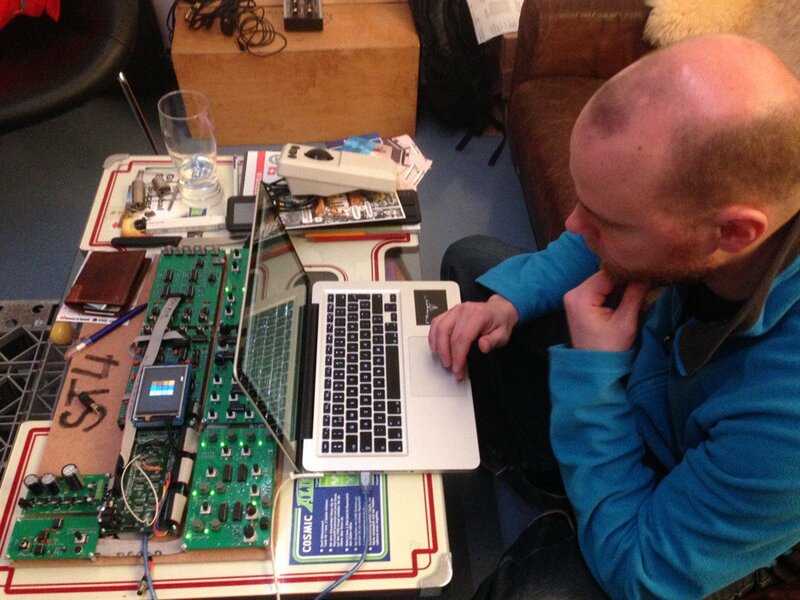 Last weekend the first fully cased Tasty Chips synths were demonstrated! The Super Piggy, an experimental follow-up of the Piggy, was cased by Matthijs, allowing all the potentiometers to come out while safely housing both the Arduino and the Superpiggy. Next to this there were the first attempts at display modules using super-sharp and vibrant OLED displays. This sets the general direction for Tasty Chips: Synthesizers usable out-of-the box. Fully cased and ready to be played and of course, loads of parameters hands-on available. In this vain, the new prototype was also designed. The TCE-1M is a monophonic analog synth with the VCO and VCA sections of the Superpiggy, combined with a multi-mode VCF + loads of features. The TCE-1M is definitely the future for us. It was demonstrated and subsequently experimented on with great interest from the public. Hence, the choice was made to slowly move away from the Piggyback devices in favor of the more hands-on controllable powerful synths.. even more powerful than the TCE-1M..
TCE-1M Monophonic Analog in aluminium fronted casing.